Sometimes, asking a question can seem like giving a high-stress, if short, speech. If you stand up in a classroom and confront the professor out loud, in front of everyone assembled, you're taking the floor--and could be displaying your own knowledge, or your ignorance. It's a risky, on-the-fly form of public speaking, one that takes confidence. Double the risk if you are questioning the authority who has the floor. And I don't know that I've ever been shy-shy, but I was a much more self-contained and less outgoing person in the earlier parts of my life. It took real effort for me to come out of some of the protective layers I had put on because of the difficulties in my childhood and some of the emotional withdrawal that I had to do to survive. It took a good part of my life to learn how to shed some of that and how to become a more people person. But I had some measure of self-confidence but not enough to feel secure among my very brilliant Yale classmates. Spent a whole lot of time in law school feeling inadequate and not quite sure that I measured up to the accomplishments of my classmates. It turns out that the question she waited so long to ask was one in which she figured out that her professor's example didn't actually prove the rule he was teaching. To top it off, it was her "first voluntary interchange with a professor." What can you learn from this question-as-speech? Are you just protecting yourself when you don't ask questions? In "Why Don't Women Raise Their Hands More?" a law student reports that "While men are more likely to be judged on their potential in professional settings,women are more likely to be judged by their achievements. In a related pattern, men's mistakes are overlooked and soon forgotten while women's mistakes are noticed and remembered." Choosing not to put your hand up might be a self-defense mechanism, not a weakness--something that women do to protect themselves. 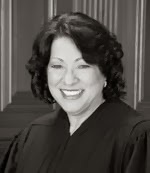 Trust your gut: Sotomayor has a facility for math, which was at the heart of the rule being discussed, so she worked out the numbers and came up with a different answer. Instead of apologizing, she simply told the professor that his example didn't fit the rule--something he had not realized in decades of teaching it. To challenge a senior attorney and professor, she had to trust in her sense that the answer was wrong. Keep your hand up: Even when women want to ask questions, they're often passed over in favor of men. Facebook COO Sheryl Sandberg's TED talk on women and leadership tells how she learned from a young woman in one of her audiences that she'd passed over the woman with her hand up, said she would stop taking questions, then called on two more men after the woman had pulled her hand down. So keep your hand up to be recognized when you have something to say. You'll find a transcript at the NPR link as well as audio of the program.